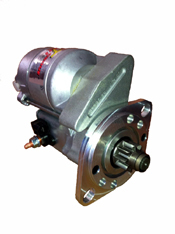 These custom designed high torque starters are built to give you more torque and cranking speed because we use off-set gear reduction to increase power. 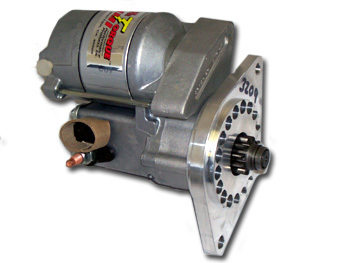 They will replace the factory style starters that do not use a solenoid on the starter. The one pictured on the left will fit all Jeep vehicles produced from 1968 through 1998 with L6 and V8 AMC engines and can be used on engines with up to 18:1 compression ratios. The front mounting plate on these starters allow you to rotate the starter for maximum clearance with the block, exhaust, oil pan, etc. They can be used with or without a remote starter relay. The starter pictured at the right is a basic picture of what the replacement starter will look like for the early Jeep and Willys vehicles. These will be 12 volt versions only. No 6 volt versions are available. Please feel free to call us at (909) 794-1600 if you have any questions about a starter for your vehicle.